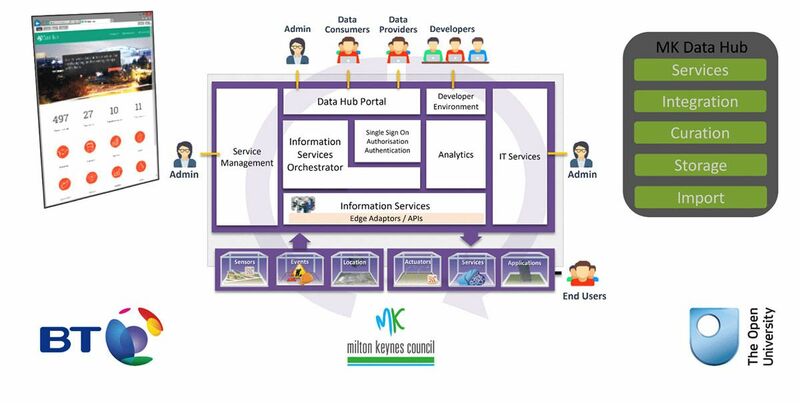 The MK Data Hub is the technical, data infrastructure of the MK:Smart project. This project recognises that smart city infrastructure creates benefits such as reduced congestion and resource use, and helps the city to be competitive. The data hub supports the collection, integration and use of large amounts of data from many sources relevant to city systems. It is a data platform for the city, enabling data from a diverse range of data providers to be accessed, and for developers to create new applications. The project has created a ‘data marketplace’ where open data can coexist with closed data, which may be private or commercially sensitive. Data providers remain in control of the redistribution policies (the data licences) and the access permissions they want to apply. Enabling access to data from diverse sources to create new city services and businesses. IoT data plus other sources have multiple uses across a number of themes including energy, water and transport. MK Data Hub is an R&D project based on a public private partnership, with potential for third parties to create business models from the data. Next steps include scaling up the benefits and expanding use cases. The technology facilitates access to data by partners and third parties. Partners include Milton Keynes Council, the Open University, BT and Catapults. Academic expertise in knowledge technologies sits alongside technology and domain expertise. Domain expertise is provided by the local authority and utilities partners. Constraints include GDPR and commercial sensitivity. Integrated databases that allow the searching of and controlled access to data. MK Smart has a core steering group. 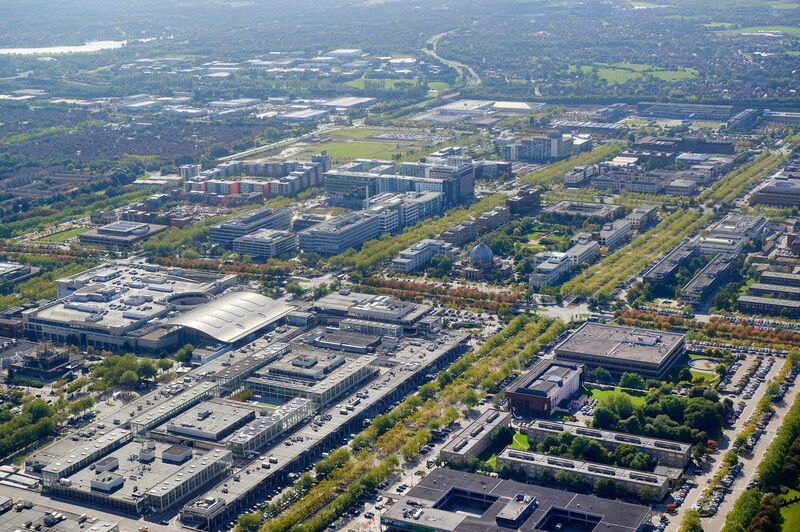 Milton Keynes has always been a ‘city of the future’ – an exemplar of master planning and innovation. With the MK:Smart project, it has taken this concept to a different level in terms of scale and ambition, building on the existing innovation cluster of universities and companies that are located in the city. The city has recognised the strategic advantage of using leading-edge technology to improve quality of life and support economic growth. The intention is that the smart city will itself generate jobs, but also attract the people who could build on the smart city infrastructure, creating startups and further jobs in a virtuous loop. The original project, which ended in June 2017, was led by the Open University and involved a consortium of 13 organisations, which included BT as the primary infrastructure partner, three universities, utilities companies and SMEs. A number of associate partners, including Samsung and Huawei, participated in the project, bringing in additional private funding to supplement the core funding provided by the Higher Education Funding Council for England (HEFCE). The project has created a business ecosystem comprising 150 organisations with different levels of involvement. The local community were involved in the project through an organisation called Community Action: MK, which facilitated the generation of ideas and feedback from the community – 13 of the ideas were financed. A number of outreach activities involved local school children and a massive open online course was developed that attracted 40,000 students worldwide. Additional funding and the continued interest of industrial partners has allowed the work to continue beyond the end date. BT has worked on developing an ecommerce model that allows data to be monetised. The Open University has worked on the means of controlling access to data. After the project ends, the existing data hub will be kept as an R&D facility managed by the Open University, which can be accessed by Open University researchers and others interested in experimenting with the technology. BT will develop these technologies separately in commercial settings. MK Smart also includes three sector workstreams – energy, water and transport. Milton Keynes was built on a grid with the assumption that there would be mass car ownership. Mobility has been a challenge since not everyone has access to a car. As the city continues to grow, congestion is becoming more of an issue and traditional measures such as road widening and traffic lights need to be supplemented by smart measures to improve transport. City growth is also putting a strain on water resources, and smart technology could be used to moderate demand for water. The energy workstream is compatible with Milton Keynes aspirations to be a ‘green’ city, building on initiatives around the smart grid and infrastructure for electric vehicles. The project team has worked with the council to make its data available through the data hub. There is a huge variety of data, both static databases and live streams, including: local and national open data; data streams from key infrastructure networks such as energy, transport and water; other relevant sensor networks such as weather and pollution data; and data crowdsourced from social media and mobile applications. The data hub is a data repository, but with a key difference: a large effort has gone into making it easier for application developers to access the data. It is automatically integrated so that it is possible to search all databases once, rather than each of the databases individually. The data catalogue supports the discovery of the data, as well as the description and traceability of the relevant metadata, such as the sources and rights that apply to the data. Not all of the data is open. For example, companies may be willing to put energy consumption data on the data hub but want to control access to the data. A mechanism has been created to precisely manage provisions and permissions. For example, it is possible specify who can have access to data and the conditions of use. A particular challenge is dealing with the relationships between the licences of multiple sets of data that are being used together. The Open University has explored the use of ‘computational licensing’ which provides a mechanism for formally characterising the licensing condition so that when two or more datasets are combined, the system can check the conditions are compatible and suggest a use. All data sources have been accepted, resulting in highly varied degrees of data quality. A minimal amount of data checking and cleaning has been carried out, and some standardisation of formats, to ensure data can be accessed through an application programming interface (API). This process also generates metadata about the provenance and licencing conditions. It is recognised that data quality must be adequate for obtaining meaningful analyses. The Open University has done some research on automatically analysing data quality by looking at different datasets at the same time to detect discrepancies. The issue of data quality is an outstanding challenge that requires further research effort. The project is HEFCE funded. As it is not possible to run commercial services on the JANET network, work has been carried out on an R&D basis for the last 3.5 years. If an SME wants to work with the project, they can be supported in developing ideas and solutions but if they want to launch commercially they need to find a solution other than the data hub. Once the hub is running as a R&D facility, it will not have the same level of service level agreement as such a facility would have in commercial setting. While MK:Smart has focused on prototyping solutions, the next phase is about scaling up. There is still great potential to develop intelligent mobility solutions from real-time data. It will be important for the project to identify new business models, as well as developing the technical aspects of the project. The first large-scale commercial development emerging from the project has been developed by Vivacity, a spin-off from MK:Smart, that has attracted funding from Innovate UK and private investors. It is a smart parking scheme in Milton Keynes that makes use of intelligent camera technology and allows drivers to book a parking space via an app. The ecommerce element of the smart city is technologically possible and has been implemented and tested. However, the concept of a data marketplace still needs to be fully proven. It is likely that this will be more successful in a particular context, such as a smart city data hub or industrial data hub.